Sabrina the Teenage Witch dominated the TGIF lineup when it premiered in 1996. It aired Friday nights on ABC, alongside Boy Meets World, Family Matters, and Two of a Kind. And it was much, much weirder than any of those. And weirder than even just a regular show about a teenage witch might have been. Sabrina the Teenage Witch could have just combined “hiding magical powers from the regular people,” à la Bewitched or I Dream of Jeannie, with a dash of the usual high school angst. In other words, what Buffy the Vampire Slayer did, albeit in a much more nuanced way. But Sabrina didn’t rely on anything so ordinary. The rules of the Other Realm, where witches come from, make up a lot of the confounding weirdness of this show. One episode revolves around the fact that a witch’s first kiss with a mortal turns them into a frog. And this only gets reversed if the witch passes three tests proving true love. YES. A teenager’s only way to make sure a boy isn’t stuck as a frog is to hope that it’s true love. And if she fails, she turns into a frog, too. The best character on Sabrina is also the one with the weirdest backstory. Salem Saberhagen is a black cat. Or, really, a witch sentenced to one hundred years as a black cat for trying to take over the world. Which is fine. I mean, it’s actually insane—but since it’s the reason that the back-talking black cat is on the show, I’m fine with it. I’m less fine with the weird cat axe the executioner wields. Or how about the whole season revolving around Sabrina getting her “witch’s license?” Which somehow meant a “Quiz Master” can show up at any time and demand she complete some sort of random task, usually with a heartwarming lesson attached. That storyline carried on for one whole season, and then the Quiz Master vanished. Another season required Sabrina to solve a series of clues about “the family secret,” which turned out to be that every member of her family has an evil twin. In some shows, the evil twin reveal might merit more than a single episode. Not Sabrina! Her evil twin gets tossed into a volcano, and then everything is fine. The evil twin secret pales in comparison to the secret that the Spellman family has an in-born addiction to pancakes. 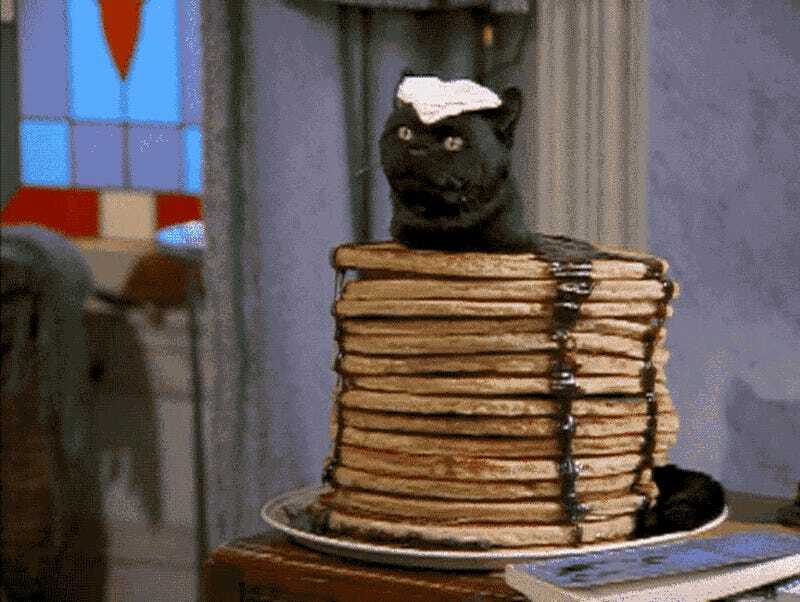 “Pancake Madness” is a third season episode that’s devoted entirely to watching Sabrina have a pancake-based meltdown. She dances the pancake samba—and then it’s never mentioned again. There’s a musical number and a lady dressed as a giant syrup dispenser. Add to all of this a number of big name cameos that were weirdly important to the plot. Sabrina didn’t just have famous people show up for single-joke scenes—although the show also did plenty of that. Britney Spears shows up, as herself, to talk to Sabrina about how she misses home. And to teach her to dance. The whole family ends up on an episode of Jerry Springer. Baseball player Brady Anderson spends an episode as Sabrina’s life coach when she gets trapped in her bad mood. Something which wasn’t a cameo at the time, but is completely confusing if you rewatch the show, is that Paul Feig was a regular in the first season. Yes, the director Paul Feig. He plays Sabrina’s much put-upon science teacher. Sabrina also had a tendency to blow through cast members like you wouldn’t believe. Sabrina’s best friend in season one is nowhere to be seen by season two. Her best friend from seasons two and three is shipped to Alaska in season four. Her nemesis goes to boarding school in season four. Her new nemesis, a trainee witch, lasts twelve episodes. Her aunts disappear after season six. The only characters who actually last the entire run of the series? Sabrina and Salem. Say goodbye to everyone but the cat, Sabrina. Sabrina the Teenage Witch was unrelentingly, gratuitously weird. But the show took that weirdness as a license to do whatever it wanted, because nothing was ever out of bounds. Even as other, more logical, TV shows fade from memory, Sabrina the Teenage Witch remains a surreal, hilarious joy-ride.